Celebrate Hispanic Heritage Month with Levitt Artists! La Santa Cecilia performs at Levitt Los Angeles. In honor of Hispanic Heritage Month, we’re turning the spotlight on some of the many talented Hispanic artists who have graced Levitt stages over the years. Each group featured brings their own unique flare to traditional styles– creating musical hybrids that are fun, unique and incredibly diverse. We are quite spoiled here in Los Angeles. Right here in our own backyard, there is a large and richly diverse Chicano/Latino community that is ripe with artistic talent. And, the appeal of Hispanic music spreads far beyond cities with large Chicano/Latino populations. In fact, just this summer alone, nearly 50 Levitt concerts across the nation showcased Chicano/Latino music, reflecting Levitt’s commitment to showcase the rich diversity of the American musical landscape. Hispanic music has a long history of shaping the landscape of American music and is likely to do so for years to come. This past July, Levitt Pavilion Westport kicked off its inaugural season with nine-time GRAMMY winner Jose Feliciano. Feliciano’s style is marked by his smooth guitar and equally smooth vocals. Growing up in Puerto Rico and New York’s Spanish Harlem, Feliciano’s style is distinctly Latin, yet bridges a wide array of musical styles. Critics refer to Feliciano as “The Greatest Living Guitarist,” and recognize him as the first Latin Artist to enter the North American market—paving the way for today’s Latino artists. With his 1968 rendition of the Door’s “Light My Fire,” Feliciano became an overnight sensation, becoming the first Latin artist with two different records on the Billboard charts. That same year, he pushed the boundaries of mainstream American music when he was asked to perform the National Anthem at the fifth game of the World Series. It was a turbulent time for the country—only months away from the assassinations of Martin Luther King Jr. and Robert Kennedy. Hoping that his music could be a vehicle for peace, Feliciano used the National Anthem to channel his gratitude for a country that he felt had given “a blind kid with a dream a chance.” The rendition was personal and unlike any rendition that had been performed before—which proved to be quite controversial at the time. However, Feliciano’s bold decision to express himself through music has given musicians of all backgrounds the freedom to personalize their renditions of the National Anthem. 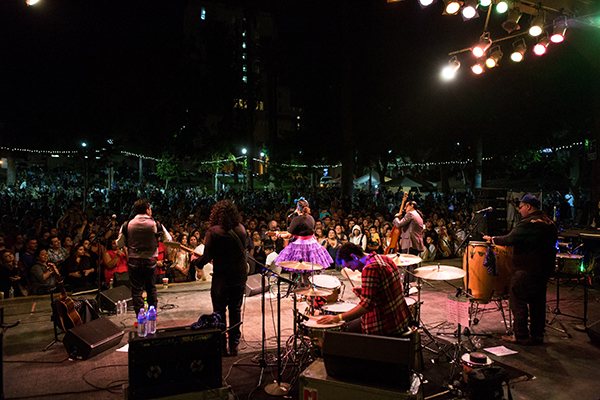 This year, Levitt Pavilion Los Angeles brought its summer concert season to a close with the inspiring and much-loved GRAMMY-winning band, La Santa Cecilia. The LA Times recently referred to La Santa Cecilia as the “musical face of the country’s fast-growing under-35 Latino population.” In today’s increasingly multicultural landscape, it’s no surprise that the bilingual stylings of La Santa Cecilia are resonating with such wide audiences. In a recent interview with KCET, La Santa Cecilia’s percussionist, Miguel Ramirez, explained that biculturalism is “a big part of what the identity is of young people our age.” He went on to explain the importance of “embracing both our cultures” and “not [being] ashamed of either one of them.” Listening to their music, you will hear the instrumentation and rhythms of Central and South America infused with North American jazz and rock’n’roll influences. They have found the hybrid sweet spot, creating music that feels familiar to Chicano/Latino audiences yet approachable to new audiences as well. This “approachability” has positioned Chicano Batman to take on “the struggle and pleasure of bringing L.A’s diverse sounds and faces together.” By celebrating the complexity and richness of their cultural identities, Chicano Batman gives their multicultural audiences permission to do the same. Quetzal has performed hybrid versions of son jarocho, ranchera, salsa—with Cuban, African and American rock infusions. Like all of the bands featured in this post, Quetzal demonstrates passion for pioneering new hybrid forms of music, while remembering their heritage—the places, people and cultures that have shaped each one of them. This past summer, Quetzal, celebrated their 20th anniversary. Here’s to 20 more creative and innovative years! We applaud all of the innovative musical hybridizers out there for creating sounds that are familiar yet innovative—illustrating the beauty and complexity of what can happen when different cultures come together, both in music and within our communities. And thank you to all of the many talented Hispanic artists who have performed at Levitt venues over the years. During Hispanic Heritage Month and every month, your dynamic and thought-provoking music makes our lives richer. This entry was posted in Levitt Artists and tagged Chicano Batman, Hispanic Heritage Month, Jose Feliciano, La Santa Cecilia, Quetzal on October 7, 2014 by Nicole McGaffey.